Remove the avocados from their skin by cutting them in half, removing the seed, and scraping the contents into a large bowl with a tablespoon. Smash the avocados with a mashed potato masher until all large chunks are well smooshed. Add the garlic, lime juice, salt, pepper, onion, and cilantro to the bowl and stir well, ensuring all ingredients are thoroughly distributed (the lime will keep the avocado from turning black too quickly from oxidation - lemon juice can be substituted depending on your taste). Serve with fresh baked chips (cut corn tortillas in half, distribute evenly across a baking sheet, spray with Pam or other cooking spray, coat with salt, and bake at 325 for 25 to 30 minutes - until brown and crispy) and salsa and/or pico de gallo. HINTS TO QUICKLY RIPEN AVOCADOS: If you cannot find ripe avocados and do not want to wait until ripe, placing them in a brown paper bag at room temperature will hasten ripening in a day or two. If in a huge rush, place unripe avocados in a 200° (F) oven for 10 minutes, moving directly to the refrigerator for 10 minutes. 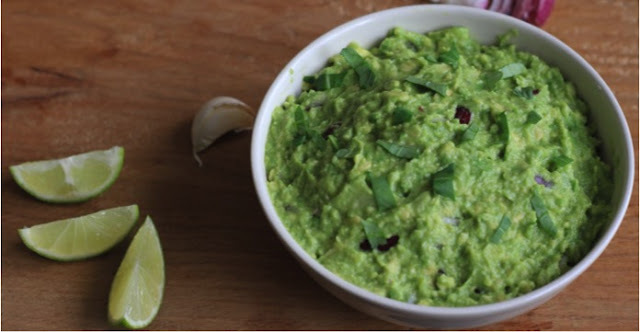 The formerly firm avocados should then be soft and ready to mash for your guac fix.